You take some bacon, some jalapeno's, cream cheese, shredded cheddar cheese and add some other ingredients, what do you get? 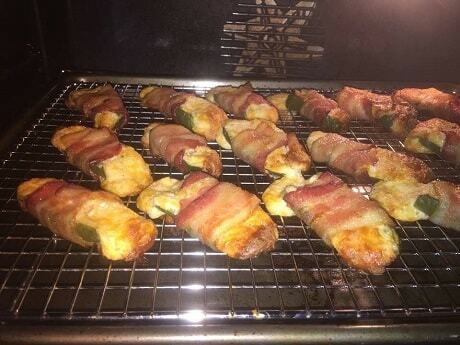 These awesome stuffed and bacon wrapped jalapeno's! Mix Cream Cheese, Buttermilk Ranch Dressing Mix and Colby Jack well for stuffing peppers. Stuff pepper halves and then wrap with half piece of Bacon. Place on cookie sheet with a wire rack inserted to let excess grease drain while cooking. Pre-Heat oven on 350° and cook till bacon is crispy. Let cool slightly and enjoy.